This is going to send you into a tailspin. 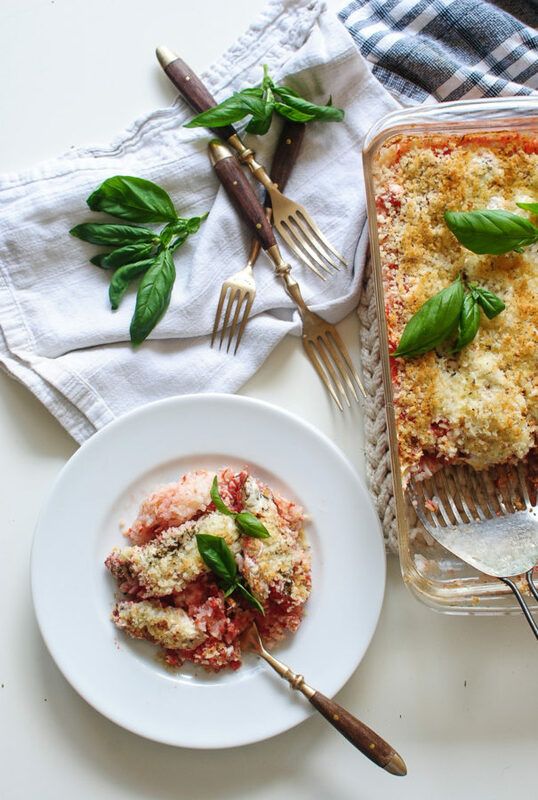 The cheesiest, chicken-iest, tomato-iest casserole HACK tailspin of yo’ life. You know my obsession with throwing a bunch of raw and dried ish into a casserole dish, slidin’ it into the oven and letting it all fall in love, get married and have casserole babies? Yep yep. Just like this Greek chicken and rice version. ‘Memba that? Right. This is that, but the Italian version! Boomidy boom. Plus, that tomato pulp heaven is straight from our backyard garden, so the flavor be like uuuuuuh. So this is what you’ll do. It’s ludicrously simple, so prepare to want to punch your computer screen. Yes, I’m showing you raw chicken, but it’s for the greater good! Seasoned chicken strips will be gently nestled and arranged on the tomatoes and rice. Just like baby birds in a nest. Except without the nest and the baby birds part. Then you’ll tear some fresh mozzarella cheese and just sort of scatter it over the top of the casserole. Go willy nilly. Get weird with it. No one’s watching. After 45 minutes of baking, flip the oven to broil and get the cheese good and browned and bubbly. Only take a nano, so do NOT WALK AWAY FROM THIS MOMENT. Sorry to scream at you. Theeeen you’ll sprinkle some panko (mixed with melted butter and Italian seasoning and a little bit of parm) all over the top, and pop her back under the broiler for seriously like a minute. Not long at all. Keep a watch on it! Like baby birds in a nes- right. This photo isn’t fabulous, but I can’t even rightly care because you neeeed to seeee what you’re in for. The rice is perfect. It soaked up all the tomato saucejuicepulp stuff and is completely wonderful. The chicken is cooked all the way through, but remains tender in all of that delicate tomato/rice biz. 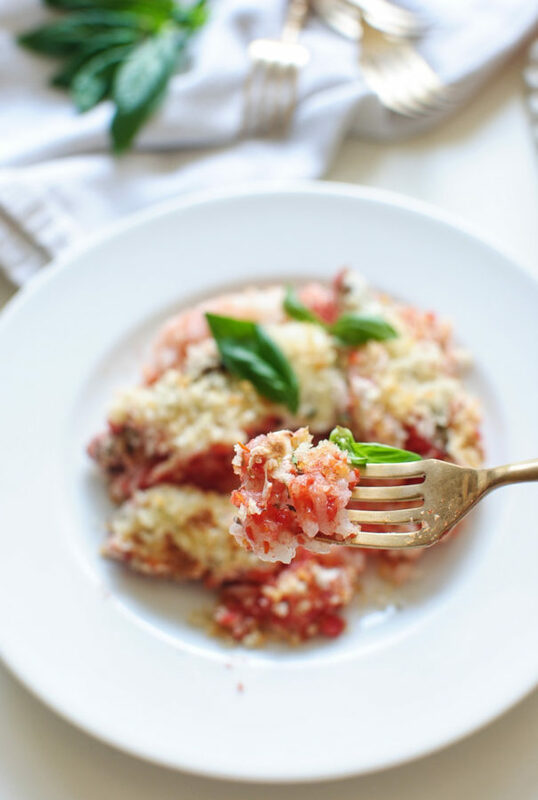 The cheese is gorgeously melted and gives the whole thing sort of a caprese flavor! Matter of dang fact, I should call this the Caprese Casserole. 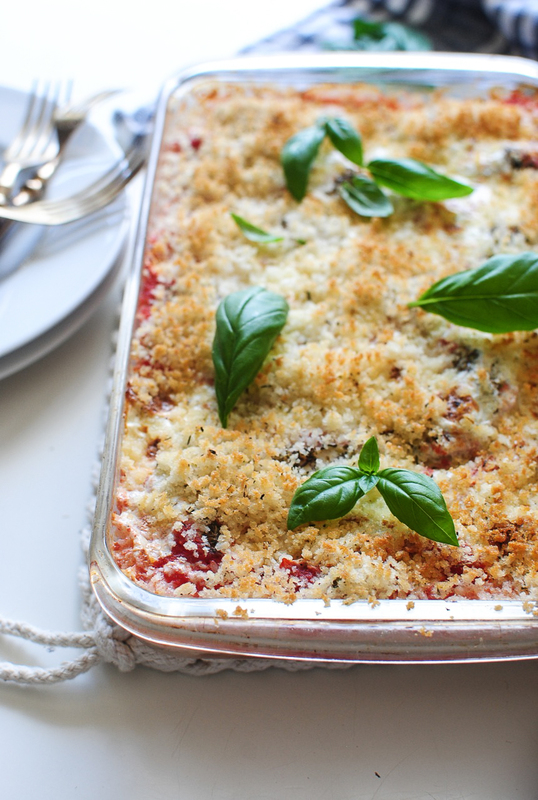 Fresh mozz + fresh tomatoes + basil on top + casserole mania = slap me, Wanda. You seriously have to try this. 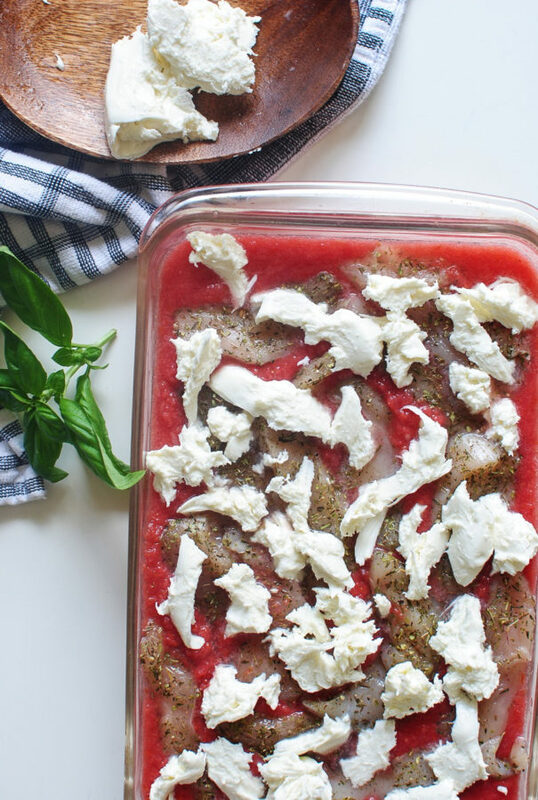 If for nothing else, to say you made a Caprese Casserole. Arrange the dried rice in the bottom of a casserole dish. 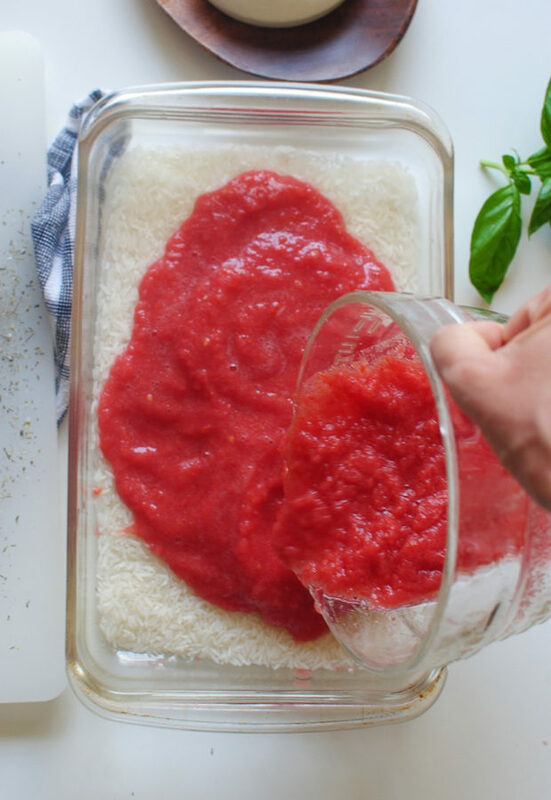 (8x12, 9x13) Evenly pour the tomato puree over the rice, covering all of it. Season the chicken strips with the Italian seasoning and a pinch of salt. Arrange over the tomatoes and rice. Scatter the torn mozzarella over the dish. Cover and bake for 45 minutes. 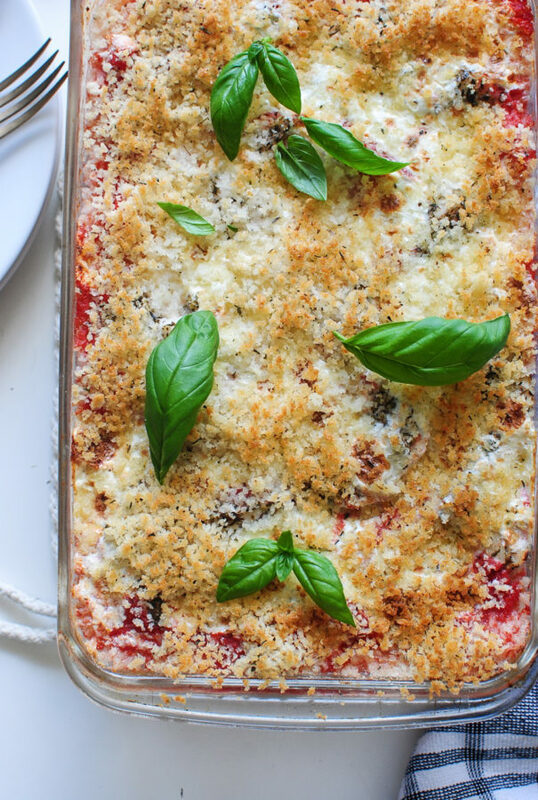 While the casserole bakes, combine the panko, melted butter, Italian seasoning and parmesan in a small bowl. Season with a tiny pinch of salt. Remove the foil and flip the oven to broil. Cook until the cheese is browned and bubbly, only a couple of minutes. Sprinkle the seasoned panko over the casserole, and broil for about a minute longer, until the panko is golden brown. Garnish with fresh basil, and DISCOVER A NEW YOU. And by that I mean, eat. 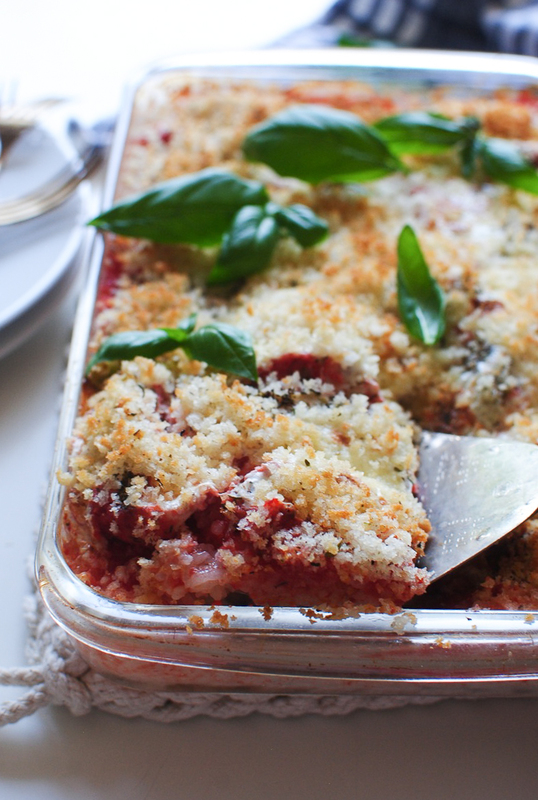 You didn’t think I could stick summer in a casserole, did you? i have to share this with my mom...because obviously I will be making one all for myself...because her FAVORITE casseroles were the ones were ya slap everything in and pop it in the oven. This would be heaven for her! And who are we kidding?! me too <3 <3 YUM! MUCH EXCITE. I love your casseroles, Bev. Trying this tonight or tomorrow. Made it last night and loved it! Thinking about maybe trying pasta next time? I bet you totally could! However, if you're using the beef, I'd brown it first, just to get the good flavor all around. Same with the meatballs. 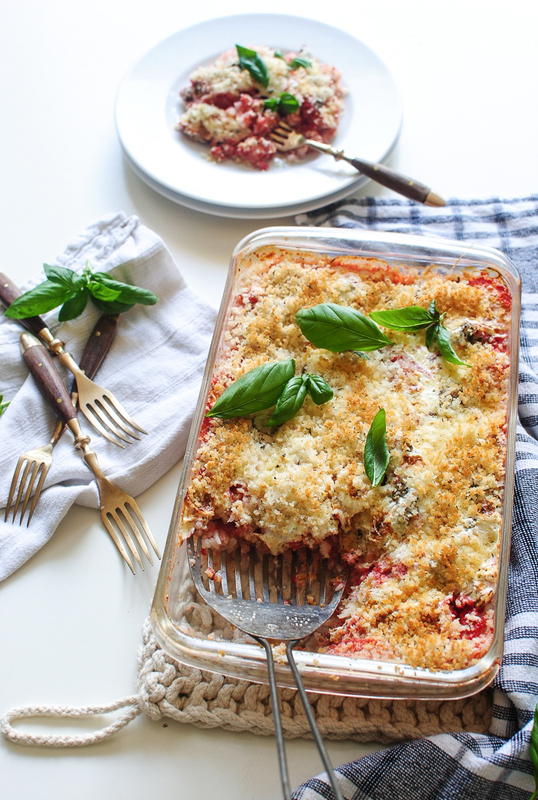 Unless the meatballs are like done like in this recipe of mine (http://bevcooks.com/2015/04/giant-mozzarella-stuffed-meatball-and-pasta-bake/), I'd make sure they were browned first, since they're buried in cheese. Let me know how they turn out! This looks so good. If it wasn't a million degrees outside and me without A/C I would be making it this very second. Thank goodness for Pinterest.